After milking Dark Souls for all it's worth, it was hard not to imagine From Software's next game being a Bloodborne sequel. It would give them an excellent install base, name recognition, and plenty of pre-orders out of the box. That made it all the more surprising that not only did the developers chose to go with an entirely new IP, but one that would be set in Sengoku Japan – the very similar setting as 2017's Nioh. If anyone could supplant Team Ninja's challenger to the "Soulsborne" throne, it would be the team that birthed the sub-genre. While Sekiro: Shadows Die Twice isn't exactly the ninja Dark Souls everyone thought they wanted, it's still a resounding success that sidesteps From's own well-trodden ground by creating something unexpectedly unique and remarkably entertaining. Sekiro is an action hack-and-slash that contains plenty of Dark Souls DNA, but it streamlines and simplifies many of the sub-genre's typical mechanisms to great effect. There's no stamina bar arbitrarily limiting your capabilities, gone are the days of dumping points into inaccessible stat sheets, and weapon durability is scrapped altogether. By shedding the more convoluted and stress-inducing RPG mechanics, Sekiro feels like a much more focused experience that concentrates on its core tenants of sword-wielding combat and exploration – both of which are executed extremely well. 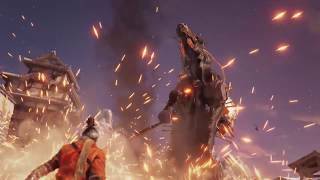 Sekiro's unique melee-focused combat doesn't come without a learning curve, but it's immensely rewarding to partake in. It's a system that's difficult to explain and only actually clicks after several hours of play, but it makes each fight feel like a precarious balancing act between risk and reward. Every enemy has a health bar but depleting it will rarely be your main concern. Instead, your focus will tend toward each enemy's posture which is indicated by a meter that starts out empty and fills up while in combat. Getting an attack in (regardless of whether that attack was blocked or not) and blocking just as a hit connects will fill that enemy's posture meter. When it's full, your adversary will be temporarily stunned which allows you to deal a devastating deathblow that depletes the rest of their health bar. Each foe's posture bar will increase faster and deplete slower the less health they have which makes damaging your enemy useful but not necessary to taking them out. It's not the most intuitive, but it's a system that works surprisingly well in practice. While the unconventional fighting mechanics will take a while to get used to, the combat has a swift sense of rhythm and finesse that rewards your precise timing and careful attention. The game's combat can be ridiculously fast, but it uses effective audio and visual cues to offer quick and direct feedback for each of your actions. If you time a block perfectly, a loud clang and a spurt of red sparks helps reinforce that precise timing. Break an opponent's posture, and a deep bass tone plays as a red dot appears to indicate that your opponent is ready for execution. More powerful attacks are always telegraphed by a red symbol, so you'll never be caught off guard by the moves that can easily take you out in a single hit. Timing a series of blocks in tandem with each of an enemy's attacks before initiating a counter-attack of your own gives every encounter an endlessly satisfying flow, whether it be against a random mob or imposing boss. Any enemy can mow you down with a few unblocked attacks, which makes every fight feel exhilarating and dangerous. You can make quick work of some enemies by just wailing on them, but groups can quickly overwhelm you and bosses will have more than one health bar to ensure they don't go down without a fight. Sekiro also utilizes a serviceable albeit unoriginal stealth system to supplement the unforgiving combat. It's a system that's far more typical of most action games these days – one that'll have you exploiting cones of vision, accidentally filling up detection meters, and taking out a guy or two before inevitably engaging in all-out combat. It feels good to sneak around while silently stabbing through and getting the drop on unsuspecting enemies, but the stealth system also illustrates how silly the game's AI can be. If you're detected and hop to the other side of a wall, the enemies will often follow your position despite being unable to see you. Other times you'll be fleeing from battle and a foe that was previously giving chase will suddenly stop in their tracks and begin walking away for seemingly no reason. It makes your enemies that otherwise exhibit a commanding presence in combat feel like mindless buffoons. Using stealth solely to perform an incognito execution or two works well enough, but it doesn't shine when you try and use it to do anything else. With the descriptions of the unconventional combat out of the way, it's imperative to note that Sekiro is very difficult. You're bound to run into someone boasting about how easily they made it through, but it's an undeniably challenging video game. Every enemy poses a threat, and bosses can leave you dead in mere seconds. Dodges require pinpoint precision and neglecting to block properly will assuredly cause a death. There are some mechanics to help take the edge off the game's high expectations, like a refillable healing gourd to recover your health in a bind, and a rechargeable resurrection ability that revives you on the spot to give things another shot. If you don't have any resurrections to use, however, you'll have to bite the bullet and accept the fact that your currency and progress toward your next skill point will be cut in half, and you'll have to start over again at the nearest Sculptor's Idol checkpoint with any defeated enemies reinstated. There isn't a variable difficulty, other than a few ways to make the game even harder than it already is, which serves as icing on an abhorrently inaccessible cake. Thankfully the controls are pretty good here and semi-remappable, but having to babysit the camera through certain sections can make things even more difficult than they should be. Many will appreciate the strenuous challenge that it offers, but the fact remains that Sekiro is not at all accommodating to the merely curious. It's a fact that'll be a huge plus for some, but a huge detractor for others. Sekiro's satisfying progression provides another resource to utilize when tackling its many daunting challenges. Every enemy you defeat inches you closer to acquiring your next skill point to unlock something on one of the game's handful of skill trees. There's a decent variety of skills on offer including passive buffs called Latent Skills, new combat maneuvers, and powerful new attacks dubbed Combat Arts. The downside with the skill tree layout is that you'll often have to spend valuable points on something you don't want before getting the things you do. The powerful Combat Arts feel notably less desirable as you can only have one equipped at a time. It makes unlocking a new one feel less like an accomplishment and more like an obligation to toy around with it to see if it's more effective than your current one. You'll also get an invaluable Memory with each boss you defeat that enhances your attack power to give you a sense of steadily increasing strength over the course of a playthrough. Using one of these Memories increases your attack stat which allows you to do a bit more damage to health and posture with each strike. You'll also come across beads that are usually dropped by mini-bosses that upgrade your maximum health and vitality after you get your hands on four. It's a notably simple system, especially when compared to the Dark Souls equivalent of levelling up and putting points into poorly-defined stats, and it's an incredibly welcome change. Defeat a boss – get more powerful. Defeat a few mini-bosses – increase your health. There's no need to second-guess your current character build or equipment; you'll be able to focus primarily on studying the moves of your opponents and finding effective ways to counter them. However, Sekiro does still have some equipment to manage in the form of prosthetic arm additions that are abysmally unbalanced. These attachments include an axe that breaks shields, shuriken that give you a ranged combat option, firecrackers that temporarily blind your enemies, and plenty more. Each one is also upgradeable if you have the requisite resources and money to spend. While each prosthetic tool has its uses, they're all incredibly situational which greatly limits their potential for effective use. What makes matters worse is that one tool proves incredibly useful in nearly every encounter and can even stun-lock some bosses into oblivion. These tools can only be used a finite number of times in each encounter as they require consumable spirit emblems to refill, but exploiting them can make many of the game's sections far easier than intended. When you're not fighting Sekiro's hordes of tough foes, you'll be running through the game's variety of stunningly open and labyrinthine locales which is surprisingly entertaining on its own. 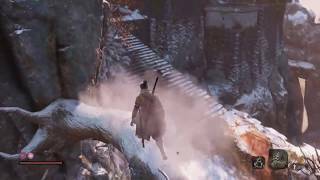 From's typical level design makes its unapologetic return in Sekiro with dead ends galore and entire sections hiding behind seemingly unimportant paths. It's a unique approach that can cause frustration, but it also leads to revelatory feelings of discovery when you find something you weren't at all expecting. There's a startling variety of settings on offer, and the developers don't let any of the typical feudal Japan scenarios go unexplored. Sekiro's integration of a grappling hook goes a long way in making exploration and movement even more effortlessly entertaining. Every location is stuffed full of grapple points that you can pull yourself up to with the press of a button. Grappling around each area provides an added dimension of verticality to the game's stages, and grapples can be chained together indefinitely to zip across areas quickly and effectively. Plenty of rooftops and structures are scalable, and they prove to be excellent vantage points from which to scout out your surroundings. Movement is just as fast as the combat, and it goes a long way in making you feel like the nimble shinobi you're inhabiting. The story is surprisingly clear-cut, especially when compared to From Software's recent catalogue, but it also keeps its details shrouded in tantalizing mystery. 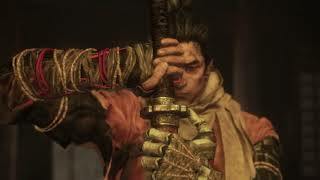 You control Sekiro – a shinobi warrior that's pledged to defend the life of the Divine Heir to the local region's throne. The story progresses in easy-to-digest portions that setup picturesque setpieces and climactic confrontations. There is plenty of mythic lore operating behind the scenes that's often referred to in dialogue with NPC's, but the average player will be able to understand character motivations and story arcs without delving into item descriptions and wiki pages which is immensely appreciated. As far as performance is concerned, Sekiro runs okay on a PS4 Pro. The framerate is left unlocked, and it's all over the map. It feels particularly jarring when you go from simple indoor locations to effects-heavy situations where there's a very noticeable deprecation in smoothness and responsiveness. Things rarely dip below 30fps, but the framerate is so inconsistent that it's hard not to notice when it dips. However, Sekiro is quite easy on the eyes as a result. The texture work doesn't hold up all that well to scrutiny, but the varied locales and masterfully crafted animations look fantastic. Whether it's a windy field of blossoms or a building engulfed in flames – the environmental design is exactly what you'd like to see in a feudal Japan setting. Sekiro: Shadows Die Twice suffers from a few minor flaws, but it's still exceedingly entertaining. Its small blemishes do little to taint the excellent combat and tight traversal that most of the game is composed of. Seeing it through to the end is an exercise in patience, quick reflexes, and persistence; but each defeated boss along the way provides a tremendously cathartic endcap to each of the game's astounding locales. Sekiro's relative simplicity is a departure for From Software, but the streamlined systems allow you to spend most of your time on the remarkably fun part: running around as a nimble ninja and stabbing some bad guys. The excellent strings-heavy soundtrack hits the right notes, and the reserved art direction is fantastic. The visuals aren't a technical marvel by any stretch, but the excellent animation work helps make up for it. Despite a few balancing issues and an occasionally janky stealth system, Sekiro's combat is a master class in game design. Enemy encounters are quick, tense, and endlessly satisfying. From Software has a firm grasp on a combat system's ideal rhythm, flow, and feel. Sekiro is a bit on the shorter side, especially if you don't die all that often. However, it's still meaty, full of secrets, and has a good helping of post-game content to participate in. After a playthrough is finished, New Game+ cranks up the difficulty and lets you do it all over again. The framerate is all over the map, but it rarely dips below 30fps. Thankfully, no major glitches occurred throughout our playthrough, but the camera would occasionally bug out in tight spaces.